In recent years, social scientists have claimed that American Jews, in particular in the younger generation, have grown more distant from Israel. 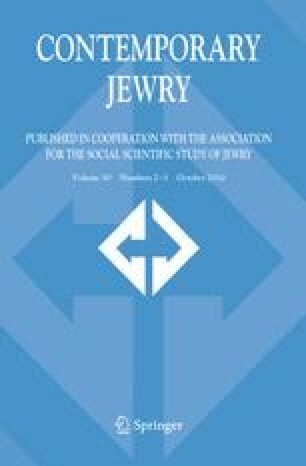 This paper draws on evidence from national surveys conducted over two decades to assess the “distancing hypothesis.” The survey data suggest that emotional attachment to Israel has varied within a narrow band, with no consistent pattern of increase or decrease. Predictions of distancing appear to be incorrect and several factors which were presumed to underlie distancing are examined: generational turnover, intermarriage and political alienation. These factors appear to have only small impact on the overall level of American Jewish attachment to Israel. An alternative narrative is suggested and the implications for the future relationship of American Jews to Israel are discussed. The authors gratefully acknowledge colleagues who commented on earlier drafts of this paper, including Steven M. Cohen, Shaul Kelner, Ezra Kopelowitz, David Mittelberg, Joel Perlmann, Benjamin Phillips, as well as this journal’s anonymous reviewers. Saad, L. March 5, 2007. Palestinian-Israeli dispute engenders American sympathy for Israelis. Gallup News Service. www.gallup.com. Accessed 4 Oct 2007.